Still, as stunning and truly awesome as last week was, “a good act does not wash out the bad, nor a bad the good,” as Stannis would say, and Season 5 needs a strong finish to compensate for all that rot. With all that riding on “The Dance of Dragons,” Game of Thrones delivered an episode that lived up to the previous penultimates. The fifth season’s second to last installment may not have packed quite the emotional gut-punch of “Baelor” or “The Rains of Castamere,” or the immense spectacle of “Blackwater” or “The Watchers on the Wall,” but its potent mix of the two yielded sensational results. Considering the incredible final frames of “Hardhome,” it’s not hard to see why Game of Thrones felt like it had to check in with Jon and the survivors of the slaughter at the hands of the White Walkers and wights, but the brief scene was certainly the least rewarding segment of the otherwise thrilling episode. It might have been more effective to leave that narrative alone for a week and return to the Wall for whatever big finish the show has in store for the audience. “The Dance of Dragons” catches up with the returning watchmen and wildlings as they reach the Wall and Thorne, after having a 700-foot stare-down with his Lord Commander, who reluctantly opens the gates and allows them inside. The Crows who remained at Castle Black aren’t all that happy to see their returning brothers and definitely aren’t happy to see the free folk. That little turd Olly wouldn’t even return Jon’s smile. If they only saw what we saw. Those who have been disappointed with Arya’s storyline this season probably perked up a bit when our ‘Lana’ spotted Ser Meryn Trant and Mace Tyrell arriving in Braavos. In case you don’t remember, this particularly member of the Kingsguard happens to be a name on our girl’s list. Or at least the girl that this girl was before she became just a girl. He’s also the piece of garbage that slapped Sansa around for Joffrey. To make the man even worse, we find out at the Braavosi brothel(thanks to a girl’s spying) that he likes his women very young. I think everyone is fine with Arya not killing the ‘Thin Man’ as long as she takes care of Trant. Even better, If she digs up needle to do the deed. It’s all the same to the Many-Face God, right? Oh, and as much as I like low-light, it was kind of refreshing to have the majority of the thread set outside the House of Black and White where we can actually see Arya’s adventures. Let’s hope the same for when she crosses the name off her list. This trip to Dorne was the best visit to Westeros’ southern kingdom all season. There were no whiffed character introductions or terribly clunky fights; just a few dialogue-heavy scenes that helped add much needed dimension to Prince Doran Martell and the Sand Snakes. It was probably wise of GOT to include Ellaria in every segment, as audiences still have fond memories of her time with fan-favorite Oberyn. Doran seems like a wise and strong ruler, keeping the peace by allowing Myrcella to return to King’s Landing while also ensuring that Dorne gets a seat on the Small Council and the marriage between the Lannister - sorry - Baratheon Princess and Trystane goes ahead as planned. The Sand Snakes improve with each viewing, probably because we’re actually getting to see their personalities and not just their accessories. As for Areo, well, he got to elbow Bronn in the face. Better than dying. Oh, and anyone else feel a bit of a spark between Ellaria and Jaime? There was something in the air. I wonder what his note says. Everyone saw this coming, right? It didn’t soften the blow very much but I knew Stannis was going to succumb to Melisandre’s request the second she made it because he’s always been an "ends justify the means" kind of guy. Add a dash of zealotry to the mix (or at least a very firm belief that the Red Priestess’ methods work) and you’re left with someone who will do just about anything to secure their destiny. It’s very Macbeth of Stannis. Of course, it was also incredibly cowardly to send Davos away before committing the terrible act. A King shouldn’t be afraid of what his Hand will say (or do), but Stannis knows he’s doing the wrong thing for the wrong reasons. He’s crossed a line that can’t be uncrossed. I wonder what Davos will do when he hears the news. Can you tell I’m trying to avoid talking about the actual scene because it was super disturbing and sad. Well-executed (pun intended, they all are) and effective but haunting. Now I really, really hope Stannis and Brienne cross-paths on his march to Winterfell. At least Game of Thrones remembered to bring a badass fight scene to the episode to help us get Shireen’s death out of our heads as soon as possible. And it was awesome enough to almost work. Almost. Now that the fighting pits have been re-opened, Meereen is holding a ‘great games’ to celebrate, and Tyrion, Dany, Hizdar, Daario and Missandei are all in attendance to watch some dudes kill each other for entertainment. Daznak’s Pit is essentially the Colosseum but with dragons instead of tigers. The show was very clever in choosing Jorah’s opponents; one fought with an ax like Areo Hotah, one fought with a spear like Oberyn and one was doing some nifty ‘needlework.’ A nice touch. The Sons of the Harpy’s sudden arrival was also extremely well done as the masks popping up in the crowd was really creepy. And then there was Drogon’s epic return. Sensing his mother needed him, he flew in just in time for a BBQ and to offer her a lift home. Or wherever else they feel like going. The CGI wasn’t flawless but the scene still gave me chills. I was making the same face as Tyrion. A triumphant ending for an Episode 9? Must be a first. 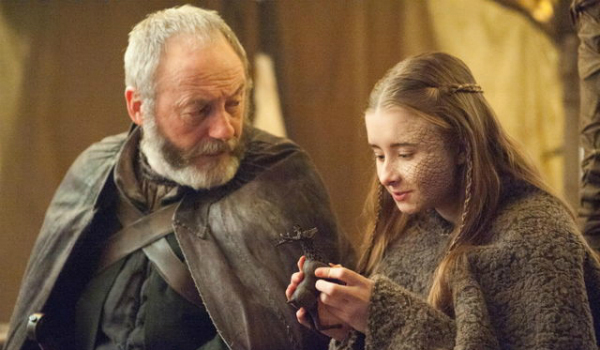 The fifth season of Game of Thrones concludes with Episode 10, “Mother’s Mercy,” next Sunday at 9:00 p.m. ET on HBO. Based on the "Song of Ice and Fire" novels by George R.R. Martin, the series was adapted for TV by David Benioff and D.B. Weiss and stars Peter Dinklage, Kit Harington, Emilia Clarke, Lena Headey and Nikolaj Coster-Waldau.